It's all in the Invitation! 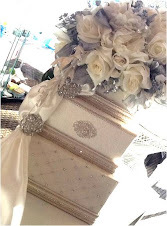 : Yvonne's "Top 10" Invitations of 2010! It's all in the Invitation! Your Invitation is your guest's first impression of your special event. Here, we give you best practices and friendly advice as it pertains to invitations, favors and more for your upcoming big day! Yvonne's "Top 10" Invitations of 2010! It's a New Year and lots to look forward to! If you are planning a special event in 2011, and looking for ideas on themes, let these Top 10 Invitations inspire you! It's time we look back at 2010 and see which were the most popular invitations sold by Yvonne's Invitations & Favors! Starting with number 10, down to number 1, these invitations cover many trendy event themes that will continue to be hot in 2011! If you don't see what you had in mind, please visit our website: http://www.invitationsbyyvonne.com/, or Contact Us for more unique inspiring ideas and we can put some suggestions together for you! ﻿Peacock themed events were very hot in 2010 and not going away anytime soon! Read our prior blog post about Peacock-inspired events and you will see why this majestic bird captured the likes of Yvonne's many brides and event planners! Enclose your invitation, direction or accommodation card and other enclosures in this bright turquoise pocket, tied together by a black satin ribbon. The shimmer invitation features a black border and peacock feathers. Direction card and enclosures are sold separately. Damask Patterns were big and will continue to be big in 2011. Black and White patterns were the most popular among damask. What's great about neutral damask patterns is the ease in coordinating with an accenting color of your choice, to compliment your theme. This white card invitation features a black and white embossed floral design on the top and bottom that borders the wording of your choice. This invitation has been a popular pick among brides surrounding their big day around a "Tiffany-Blue" color-theme. With matching accessories and favors, this simple & classic invitation, trimmed in Aqua compliments many blue-color schemes for numerous events! This invitation is perfect for any princess event, whether a Wedding, Bridal Shower or Sweet Sixteen. Incorprating a Disney-Princess theme in event planning, proofs year after year, to be age-proof! Read our prior post about Princess-Themed invitations. Make dreams come true with this dreamy invitation featuring a pearl embossed scene of Cinderella on her way to the ball! The look is completed with a delicate white satin bow. Due to the unique size of this invitation, extra postage is required. Customer assembly is required. 7" x 7"
Who can resist this heart-themed invitation with ribbon? A favorite among many Brides planning their Special Day on during Valentine's Day Month or who simply want to incorporate a Romantic Theme! Coordinating Heart Favors also available. This simply elegant invitation features a die-cut heart that is accented by your choice of satin ribbon. Your names and wedding date are printed on the front of this white z-fold invitation. Tuck your reception and respond cards behind the ribbon inside the invitation. Extra postage required. This vibrant invitation screams fall harvest! 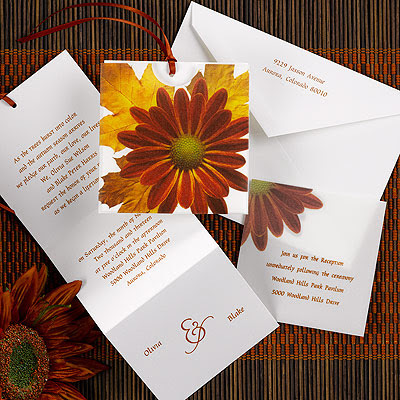 Among the many fall invitations we offer, this was a top seller because of its colorful, and and bold design. Coordinate in matching brown or rust-orange color lettering to comliment your entire theme down to teh very last detail! We also offer a variety of matching Fall-themed favors! A white z-fold invitation insert tucks away perfectly into this translucent pocket featuring an autumn daisy on the front. The insert has a pre-cut ribbon in the color of your choice: lemon, black, white, silver, blush, magenta, bay, breeze, navy, purple, olive, sage, orange, ginger, claret, mocha, or passion. Beach-themed events and Destination Weddings are becoming bigger and more elaborate each year. When surrounding your theme around the beach, sand and seashells are your palatte. That is why this transluscent unique invitatation is among Yvonne's Top 3! Coordinating favors also available. Write your adventures down on a message in a bottle. Printed on a translucent paper, the image of a bottle appears to have just arrived at shore. Please indicate names to be printed on the top and the date to be printed on the bottom of your invitations. Everyone went wild over this Fashionista invitation in fuchsia and black zebra stripe! This fun and electrifying invitation was in popular demand for Sweet Sixteens, Bat Mitzvahs and other fun Girl Events! This invitation will contiunue to sizzle it's way into 2011! Coordinating Girl Event Favors also available. Note: This invitation's design can be changed to accommodate ANY event! It's you sweet sixteen so celebrate in style with this bright white, tea-length invitation card featuring a French kiss and ebony background with zebra design. Modern Romance best describes "Yvonne's Invitations" #1 Invitation of 2010! This invitation proves no doubt that love is classic, and love has no boundries with this double-heart design! This best-selling design was popular among Valentine's Day Brides and Brides choosing a Romantic Theme. Coordinating Hearts favors also available. Invite family and friends to "celebrate the beginning of your new life together" with this white z-fold invitation. Your wording is displayed on the inside middle panel. The wording on the inside right panel reads "Two lives Two Hearts joined together in friendship, united forever in Love". 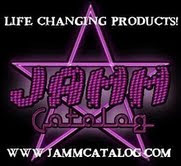 Visit our Showroom or Shop Online! 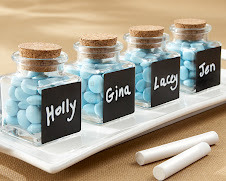 Yvonne has Coordinating Favors for Your Evert! 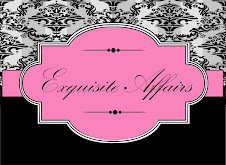 Featured: Chalk Favors...all the Rage! Add a little sparkle to your party with embellished Candy Bar Favors by Yvonne! 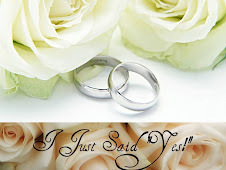 To see Yvonne's complete list of "Preferred Vendors", please visit The Vendor Community Tab of our website. To see your banner here, contact Yvonne for ad packages or partnership opportunities.